I recently completed some web copy for a new client, Arleene McFarlane, who is in the process of updating her website. The new copy will be live in the New Year. “I hired Sharon to breathe some life into the contents of my website, as I wanted to make it more engaging and reflective of what my job entails. I found her very methodical and organised. She responded quickly to my mails, met the deadlines set, and most of all, I found her flexible; she willingly tweaked my copy (more than once), offered many solutions to problems encountered and I felt involved and at the centre of the project. 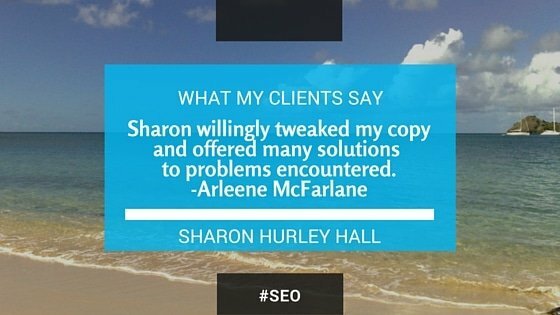 Thanks, Arleene; it was a pleasure working with you, too.